It does call to mind both Rolt and Blagrove, doesn't it. First some gratuitous photos of two Grand Union boats going breasted up into a Grand Union lock. This was Seabrook bottom lock, and clearly we were breasted up for the flight of three. Often we did this just because it made it easier to position the boats in the lock, rather than one coming in first and trying to stay against the side while the other one came in, but in this case I'd clearly also got off to do some work. This was July 29th, our first full day of travelling with Renfrew and I am amazed, going back and counting, to see that we did twenty-six locks that day. I know that's not necessarily a vast number, but the seventeen narrow ones we did on our final day with Renfrew felt like a lot more (especially to Jim, I suspect). But then, two boats and four people in a big lock is less work than one boat with two people in a small one, because you have a spare person, and company. We did quite a lot of breasting up and singling out over the course of the trip. We took the boats up Marsworth together very successfully, with me setting ahead; we tried the same thing less successfully coming down Hanwell. Once again the boats were tied together with Pete steering, Jim and Irene worked the locks, and I went ahead to get them ready. I was nearly at the bottom of the flight when I noticed there was a lot of water coming down. I wondered whether I should go and investigate but didn't want to be running backwards and forwards so finished my task and got the last lock ready before turning back. It transpired that one of the gates hadn't opened completely and the boats had got stuck on the way out. An attempt to flush them out - which accounted for the water - had only succeeded in lifting them up to stick higher, tipped in towards each other. Somehow - involving Pete having a self taught crash course in Chertsey's controls - by dint of serious reversing of both boats they were pulled back into the lock, and I arrived just in time to see them starting to come out singly while Irene trudged off up the flight to replace the water in the pound above. So it wasn't all plain sailing, even on the GU. We did a fair bit of breasting up on the Thames as well, on our way back. Often coming to a lock it would have been greedy to hog 144' of landing stage so we tended to tie up to each other, and then it was easiest to go into the lock together and only have one set of ropes to worry about. 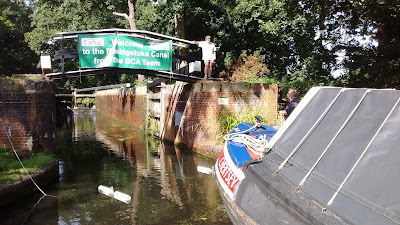 Here we are doing that at Chertsey (I don't think I took photos at any other Thames locks). Although we parted company with Renfrew on arrival at Weybridge as they were booked up the Basingstoke on the Tuesday, and us not until the Friday, by a fortuitous quirk of organisational breakdown, we ended up tied next to them for the duration of the festival. Thus when we finally parted company over a week later it felt quite odd to be without our (non identical) twin. Incidentally, having finished Bread Upon The Waters last night, I have spent a lot of today reading The Quiet Waters By. At the same time, listening to June Tabor singing 'Unicorns' had me in unexpected tears - common themes of elegy and loss and yearning - which were not just for the loss of the distant (to me) past which I will never know; nor just that of the author of those books whose young self springs so vividly from the pages, but also for the much more recent past, which is no more capable of being recaptured than that of fifty years ago, for the end of the summer, and some of the best boating I have known. Having sorted the photographs out, I moved on to cataloguing the rest of my accumulated Chertsey paraphernalia; a long overdue task. I now have two lever arch files, each with its contents safely stored and ordered in plastic wallets - one is of Chertsey's history prior to my ownership, including copies (and originals where I have them) of all the photos, along with records of maintenance, work done and major purchases; the second is a record of trips made and events attended, including copies of the log and souvenirs like rally programmes and licences. I was quite surprised to be reminded of just how much boating we did in some previous years, especially as Chertsey was nowhere near as commodious then as she has since become. Additionally, I still worry about Google not paying their electricity bill - or, it occurred to me suddenly the other morning, taking it into their little corporate heads to start charging for their services - so I investigated the possibilities of turning the blog into PDFs that I could keep and even print. I found BlogBooker which seems to do the job very well, and this helpful guide to using it. With the free version you can only do four years worth of blog every six months, but I'll take the chance on Google lasting that long. I've now got PDFs of 2010, 2011, 2012 and 2013. In the spring I'll do the rest. I would like to get round to printing them, but 2010 (albeit that was the year I blogged nearly every day) amounts to over 400 pages. I wonder how many words I've written over the years; a few books' worth, I've no doubt. One thing I did notice in the process is that some of the photos on the blog have disappeared, and I suspect that these are the ones uploaded using Blogpress while it still worked. I can only guess that these were hosted somewhere different from the ones uploaded directly to Blogger, and that this has since ceased to exist or the links have been broken. It's frustrating, but thankfully only applies to a small minority of the photos. Talking of books, at Alvecote I had another excellent and keenly priced selection from the Chesterfield Canal Society stall: David Bolton, Race Against Time; Vivian Bird, By Lock and Pound; Roger Squires, Canals Revived, David Owen, Water Rallies, and P.A.L. Vine's volumes on the waterwats of East and West Sussex, which Jim has taken back to East Sussex to peruse. I have finished Race Against Time, which is a very readable account of the establishment and campaigns of the IWA - and its internal politics, horribly familiar to anyone who's been involved with a voluntary and/or campaigning organisation. After that I was moved to re-read David Blagrove's Bread Upon The Waters for the third or fourth time. It really is very good; easily as eloquent and elegaic as Rolt, with a more likeable author, and also with funny bits, which Rolt certainly does not offer.